Retailers offering sales on Thanksgiving Day resulted in less hectic shopping at Oakbrook Center during this year’s Black Friday. “I was shocked we would be starting our sale on Thursday,” said Kia Irby, a salesperson at Sephora, about 11:30 p.m. on Thanksgiving. The cosmetics store, Macy’s, Bath & Body Works, Victoria’s Secret and a few other retailers at the shopping center opened their doors and offered holiday deals from 6 p.m. to midnight on Thanksgiving. So after stuffing themselves with turkey shoppers drove over to the mall and stuffed their cars with bags thanks to holiday deals, such as Macy’s 30 to 50 percent off on select items and Bath and Body’s buy three, get three free mix and match deal. Irby said that since she started her shift about 5 p.m. she’d seen a steady trickle of shoppers come into the store. It had only become slightly more hectic an hour before their midnight closing time. The Thanksgiving hours may have stolen a little bit of Black Friday’s retail thunder because, unlike previous holiday shopping, the mall only had a handful of lines outside retailers that evening. While opening on Thanksgiving Day doesn’t work for every company, those who did back in 2012 opened their doors to millions of holiday shoppers eager to take advantage of holiday deals ahead of Black Friday, said a release from the National Retail Federation. A study from the foundation found that 28 percent of those who shopped Thanksgiving weekend in 2012 were at stores by midnight on Thanksgiving, up from 24 percent in 2011 and just 10 percent in 2010. Some of the explanation for the growth lies in the math itself — more companies are now open on Thanksgiving. Fifty-four of Oakbrook Center’s retailers opened on Thanksgiving this year, with a few continuing their sales into Friday though 10 p.m. without closing overnight. The foundation reported many retailers have learned through direct feedback from Thanksgiving shoppers that they prefer to shop at night than to set the alarm and brave the cold on the morning on Black Friday. One such retailer with huge line of millennials itching to take advantage of Black Friday deals was Urban Outfitters. It had a more than 300 people lined up outside waiting in the 18 degree cold for its doors to open at midnight. 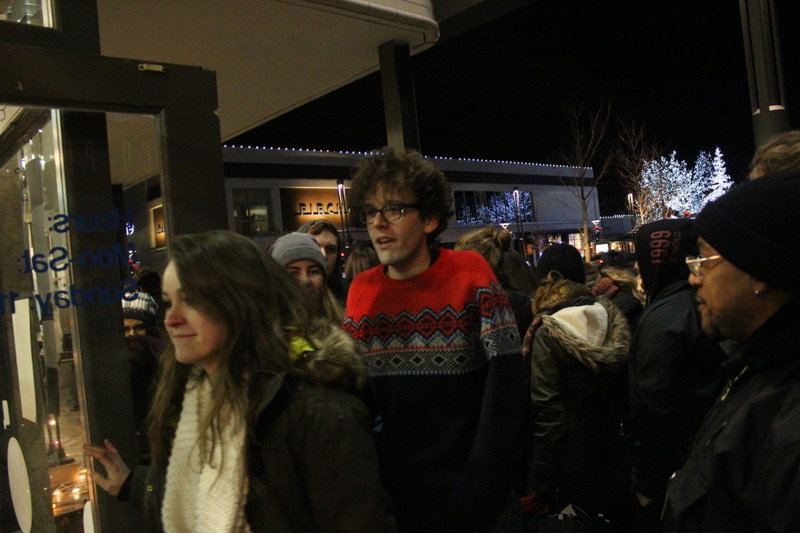 “We’ve been waiting out here for about 20 minutes,” said Lauren Parse, at about 11:45 p.m., outside the trendy store. Oakbrook Center was the second mall she and her friend Madison Bagby had been shopping at. A few hours earlier they were Yorktown Center in Lombard but decided to head over to Urban Outfitters to take advantage of its 50 percent off Black Friday sale. While the line waited to get in, the store’s retail staff popped outside about 10 minutes before opening to raffle off a $200 gift card and announce that, due to safety concerns, only 250 people were going to be allowed in the store at a time. Once the doors opened at midnight the store was at capacity in about five minutes. “Time and a half, that’s why I’m out here in the cold,” joked Chris Chenier, a mall security guard. He was stationed outside the Urban Outfitters to help with the store’s crowd control. He’s no stranger to Black Friday crowds and said that compared to last year, this one was much quieter. “I was surprised when I got here last night at 9 p.m. I could drive right up and get a parking spot right away,” he said. Thanksgiving weekend this year was expected to have over 140.1 million shoppers taking advantage of holiday deals, according to a release from the retail foundation. Specifically, 67.6 million holiday shoppers were expected to shop, which was down slightly from last year’s 69.4 million. Moreover, in a survey 72.5 million told the foundation they would wait and see if the holiday weekend’s deals were worth it before they decide to head out. About 1 a.m. on Friday, Puja Sethi and Komal Julka were ordering drinks at the Starbuck’s kiosk inside Macy’s. Julka started her night off at Best Buy and said she was mostly unimpressed with the deals being offered that she’d seen.